A herniated disc occurs when the gel-like center of a disc ruptures through a weak area in the tough outer wall, similar to the filling being squeezed out of a jelly doughnut. Back or leg pain, numbness or tingling may result when the disc material touches or compresses a spinal nerve. Treatment with rest, pain medication, spinal injections, and physical therapy is the first step to recovery. Most people improve in 6 weeks and return to normal activity. If symptoms continue, surgery may be recommended. Your spine is made of 24 moveable bones called vertebrae. The lumbar (lower back) section of the spine bears most of the weight of the body. There are 5 lumbar vertebrae numbered L1 to L5. The vertebrae are separated by cushiony discs, which act as shock absorbers preventing the vertebrae from rubbing together. The outer ring of the disc is called the annulus. It has fibrous bands that attach between the bodies of each vertebra. Each disc has a gel-filled center called the nucleus. At each disc level, a pair of spinal nerves exit from the spinal cord and branch out to your body. Your spinal cord and the spinal nerves act as a "telephone," allowing messages, or impulses, to travel back and forth between your brain and body to relay sensation and control movement (see Anatomy of the Spine). A herniated disc occurs when the gel-like center of your disc ruptures out through a tear in the tough disc wall (annulus) (Fig. 1).The gel material is irritating to your spinal nerves, causing something like a chemical irritation. The pain is a result of spinal nerve inflammation and swelling caused by the pressure of the herniated disc. Over time, the herniation tends to shrink and you may experience partial or complete pain relief. In most cases, if low back and/or leg pain is going to resolve it will do so in about 6 weeks. Figure 1. Normal and herniated disc. 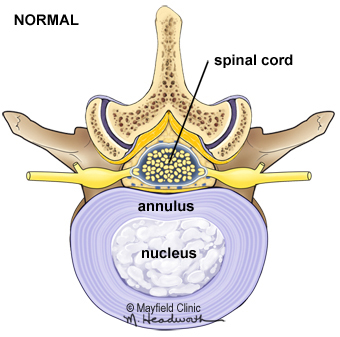 The gel-filled nucleus material escapes through a tear in the disc annulus and compresses the spinal nerve. 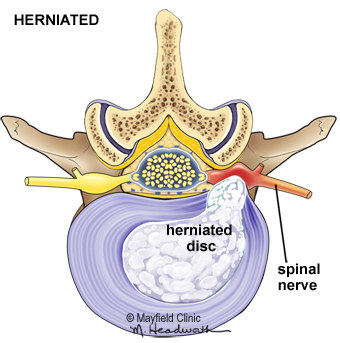 Different terms may be used to describe a herniated disc. A bulging disc (protrusion) occurs when the disc annulus remains intact, but forms an outpouching that can press against the nerves. A true herniated disc (also called a ruptured or slipped disc) occurs when the disc annulus cracks or ruptures, allowing the gel-filled center to squeeze out. Sometimes the herniation is so severe that a free fragment occurs, meaning a piece has broken completely free from the disc and is in the spinal canal. Most herniated discs occur in the lumbar spine, where spinal nerves exit between the lumbar vertebrae, and then join together again to form the sciatic nerve, which runs down your leg. Symptoms of a herniated disc vary greatly depending on the location of the herniation and your own response to pain. If you have a herniated lumbar disc, you may feel pain that radiates from your low back area, down one or both legs, and sometimes into your feet (called sciatica). You may feel a pain like an electric shock that is severe whether you stand, walk, or sit. Activity such as bending, lifting, twisting, and sitting may increase the pain. Lying flat on your back with knees bent may be the most comfortable because it relieves the downward pressure on the disc. Sometimes the pain is accompanied by numbness and tingling in your leg or foot. You may experience cramping or muscle spasms in your back or leg. In addition to pain, you may have leg muscle weakness, or knee or ankle reflex loss. In severe cases, you may experience foot drop (your foot flops when you walk) or loss of bowel or bladder control. If you experience extreme leg weakness or difficulty controlling bladder or bowel function, you should seek medical help immediately. Discs can bulge or herniate because of injury and improper lifting or can occur spontaneously. Aging plays an important role. As you get older, your discs dry out and become harder. The tough fibrous outer wall of the disc may weaken. The gel-like nucleus may bulge or rupture through a tear in the disc wall, causing pain when it touches a nerve. Genetics, smoking, and a number of occupational and recreational activities may lead to early disc degeneration. Herniated discs are most common in people in their 30s and 40s, although middle aged and older people are slightly more at risk if they're involved in strenuous physical activity. Lumbar disc herniation is one of the most common causes of lower back pain associated with leg pain, and occurs 15 times more often than cervical (neck) disc herniation. Disc herniation occurs 8% of the time in the cervical (neck) region and only 1 to 2% of the time in the upper-to-mid-back (thoracic) region. When you first experience pain, consult your family doctor. Your doctor will take a complete medical history to understand your symptoms, any prior injuries or conditions, and determine if any lifestyle habits are causing the pain. Next a physical exam is performed to determine the source of the pain and test for any muscle weakness or numbness. Your doctor may order one or more of the following imaging studies: X-ray, MRI scan, myelogram, CT scan, or EMG. Based on the results, you may be referred to a neurologist, orthopedist, or neurosurgeon for treatment. Magnetic Resonance Imaging (MRI) scan is a noninvasive test that uses a magnetic field and radiofrequency waves to give a detailed view of the soft tissues of your spine. Unlike an X-ray, nerves and discs are clearly visible (Fig. 2). It may or may not be performed with a dye (contrast agent) injected into your bloodstream. An MRI can detect which disc is damaged and if there is any nerve compression. It can also detect bony overgrowth, spinal cord tumors, or abscesses. Figure 2. 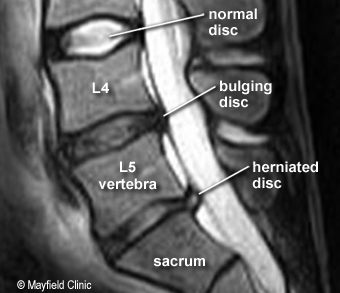 MRI image and illustration show a disc herniation between the L5 vertebra and the sacrum. On MRI healthy discs appear white and plump, while degenerative, dried out discs appear grayish and flattened. Myelogram is a specialized X-ray where dye is injected into the spinal canal through a spinal tap. An X-ray fluoroscope then records the images formed by the dye. The dye used in a myelogram shows up white on the X-ray, allowing the doctor to view the spinal cord and canal in detail. Myelograms can show a nerve being pinched by a herniated disc, bony overgrowth, spinal cord tumors, and abscesses. A CT scan may follow this test. Computed Tomography (CT) scan is a noninvasive test that uses an X-ray beam and a computer to make 2-dimensional images of your spine. It may or may not be performed with a dye (contrast agent) injected into your bloodstream. This test is especially useful for confirming which disc is damaged. Electromyography (EMG) & Nerve Conduction Studies (NCS). EMG tests measure the electrical activity of your muscles. Small needles are placed in your muscles, and the results are recorded on a special machine. NCS is similar, but it measures how well your nerves pass an electrical signal from one end of the nerve to another. These tests can detect nerve damage and muscle weakness. X-rays view the bony vertebrae in your spine and can tell your doctor if any of them are too close together or whether you have arthritic changes, bone spurs, or fractures. It's not possible to diagnose a herniated disc with this test alone. Conservative nonsurgical treatment is the first step to recovery and may include medication, rest, physical therapy, home exercises, hydrotherapy, epidural steroid injections (ESI), chiropractic manipulation, and pain management. With a team approach to treatment, 80% of people with back pain improve in about 6 weeks and return to normal activity. If you don’t respond to conservative treatment, your doctor may recommend surgery. Self care: In most cases, the pain from a herniated disc will get better within a couple days and completely resolve in 4 to 6 weeks. Restricting your activity, ice/heat therapy, and taking over the counter medications will help your recovery. Medication: Your doctor may prescribe pain relievers, nonsteroidal anti-inflammatory medications (NSAIDs), muscle relaxants, and steroids. Nonsteroidal anti-inflammatory drugs (NSAIDs) (NSAIDs), such as aspirin, naproxen (Alleve, Naprosyn), ibuprofen (Motrin, Nuprin, Advil), and celecoxib (Celebrex), are used to reduce inflammation and relieve pain. Analgesics, such as acetaminophen (Tylenol), can relieve pain but don’t have the anti-inflammatory effects of NSAIDs. Long-term use of analgesics and NSAIDs may cause stomach ulcers as well as kidney and liver problems. Muscle relaxants, such as methocarbamol (Robaxin), carisoprodol (Soma) and cyclobenzaprine (Flexeril), may be prescribed to control muscle spasms. Steroids may be prescribed to reduce the swelling and inflammation of the nerves. They are taken orally (as a Medrol dose pack) in a tapering dosage over a five-day period. It has the advantage of providing almost immediate pain relief within a 24-hour period. Steroid injections: The procedure is performed under x-ray fluoroscopy and involves an injection of corticosteroids and a numbing agent into the epidural space of the spine. The medicine is delivered next to the painful area to reduce the swelling and inflammation of the nerves (Fig. 3). About 50% of patients will notice relief after an epidural injection, although the results tend to be temporary. Repeat injections may be given to achieve the full effect. Duration of pain relief varies, lasting for weeks or years. Injections are done in conjunction with a physical therapy and/or home exercise program. Figure 3. 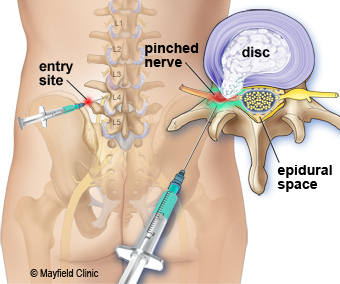 During an ESI injection, the needle is inserted from the back on the affected side to reach the epidural space to deliver steroid medication (green) to the inflamed nerve root. Physical therapy: The goal of physical therapy is to help you return to full activity as soon as possible and prevent re-injury. Physical therapists can instruct you on proper posture, lifting, and walking techniques, and they’ll work with you to strengthen your lower back, leg, and stomach muscles. They’ll also encourage you to stretch and increase the flexibility of your spine and legs. Exercise and strengthening exercises are key elements to your treatment and should become part of your life-long fitness. Holistic therapies: Some patients find acupuncture, acupressure, nutrition / diet changes, meditation, and biofeedback helpful in managing pain as well as improving overall health. Surgery for a herniated lumbar disc, called a discectomy, may be an option if your symptoms do not significantly improve with conservative treatments. Surgery may also be recommended if you have signs of nerve damage, such as weakness or loss of feeling in your legs. Microsurgical discectomy: The surgeon makes a 1–2 inch incision in the middle of your back. 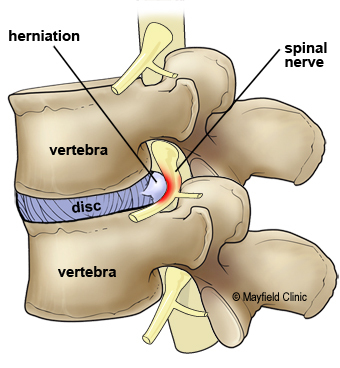 To reach the damaged disc, the spinal muscles are dissected and moved aside to expose the vertebra. A portion of the bone is removed to expose the nerve root and disc. The portion of the ruptured disc that touches your spinal nerve is carefully removed using special instruments. About 80–85% of patients successfully recover from a discectomy and are able to return to their normal job in approximately 6 weeks. Minimally invasive microendoscopic discectomy: The surgeon makes a tiny incision in the back. Small tubes called dilators are used with increasing diameter to enlarge a tunnel to the vertebra. A portion of the bone is removed to expose the nerve root and disc. The surgeon uses either an endoscope or a microscope to remove the ruptured disc. This technique causes less muscle injury than a traditional discectomy. Clinical trials are research studies in which new treatments—drugs, diagnostics, procedures, and other therapies—are tested in people to see if they are safe and effective. Research is always being conducted to improve the standard of medical care. Information about current clinical trials, including their eligibility, protocol, and locations are found on the web. Studies can be sponsored by The National Institutes of Health (NIH), clinicaltrials.gov, as well as private industry and pharmaceutical companies, www.centerwatch.com. Back pain affects 8 of 10 people at some time in their lives, and usually resolves within 6 weeks. A positive mental attitude, regular activity, and a prompt return to work are all very important elements of recovery. If your regular job cannot be done initially, it is in the patient's best interest to return to some kind of modified (light or restricted) duty. Your physician can give prescriptions for such activity for limited periods of time. disc (intervertebral disc): a fibrocartilagenous cushion that separates spinal vertebrae. Has two parts, a soft gel-like center called the nucleus and a tough fibrous outer wall called the annulus. sciatica: pain that courses along the sciatic nerve in the buttocks and down the legs. Usually caused by compression of the fifth lumbar spinal nerve. vertebra: (plural vertebrae): one of 33 bones that form the spinal column, they are divided into 7 cervical, 12 thoracic, 5 lumbar, 5 sacral, and 4 coccygeal. Only the top 24 bones are moveable. We treat more than 2,250 patients with herniated lumbar disc problems each year.